You have a handful of staff working from home or perhaps your entire company telecommutes. Either way, you need a virtual phone system that does not require everyone to be in the same office – or even the same zip code. 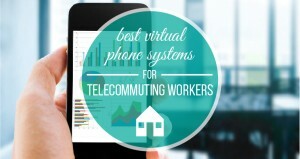 Luckily, most virtual phone system providers do cater to telecommuting workers, but some are better than others. Depending on how much time your telecommuting workers will actually spend on the phone, you have a few providers to choose from. 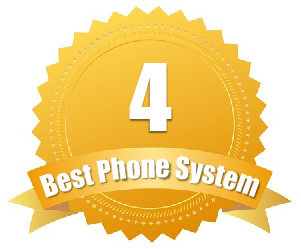 These Best Virtual Phone Systems are offered by companies that strive to help your stay in constant communication with your workers – and even allows telecommuting employees to interact in meetings. Ring Central prides itself on flexibility, which is why they categorize Ring Central works hard to make it so that your telecommuting staff don’t have to jump through hoops just to stay connected. You can add virtual numbers, extensions and even use softphone apps to communicate with employees working “off the grid” so to speak. Your telecommuting workers can still access all of the great features that come with Ring Central plans and because they are mobile-app ready, your telecommuting workers can use their own smartphone to accept business calls too. For telecommunicating purposes, you will want to stick with the Office plans from Ring Central. There are three to choose from and these will depend on how many minutes you need for all of your telecommuting workers. You can choose from the Standard, Premium and Enterprise plans – allowing you up to as many as 10000 minutes and each comes with unlimited local and long distance calling. Prices will range from $24.99 per month, per user to as high as $44.90 per month, per user. Want to try it free first? Finding the right VoIP provider for telecommuting workers isn’t easy. You can make sure Ring Central is right for you by trying them for free for 30 days. Truly unlimited minutes - even unlimited toll free! Phone.com makes keeping your telecommuting staff in the loop easy. With both their Base Plan(shared minutes) and their Unlimited Minutes Extensions, you can add as many users as you would like to your account – including those in different zip codes – or even different countries. Because extensions are virtual, it doesn’t matter where your employee is – they can take a call from their home office, cell phone, or even a hotel while traveling on business. You will still get to share all of the features that come with your Phone.com account with telecommuting staffers as well and there are no contracts. Phone.com offers a Base Plan for $9.99/month, but these minutes(100) are shared across all users. For telecommuting, you are better off using their unlimited minutes plan extensions, which includes unlimited local and long distance calling, no fair use limitations and just $23.99 per month per user. You can add additional phone numbers for your telecom staff for just $4.99 per month, per number. 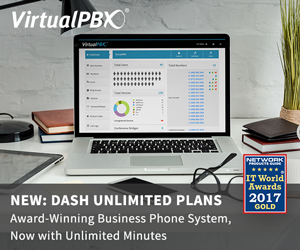 Virtual PBX was created with telecommuting workers and companies in mind. Because they cater to small businesses that often work from home, they created the AnyWhere set of plans to help businesses keep their telecommuting workers in the loop. AnyWhere plans do not have unlimited minutes, so telecommuting workers will need to be careful about how much they use each month. These plans come with conference minutes – so that your telecommuting workers can join monthly meetings and conference calls too. 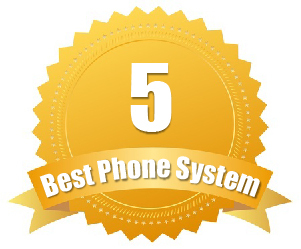 Also, you can use a smartphone as a softphone with Virtual PBX – so you don’t have to purchase your telecommuting workers any additional equipment. The AnyWhere Plans from Virtual PBX range from $9.99 per month (Startup) to $19.99 per month (Pro) to $24.99 per month (Premium). Each have minute restrictions ranging from 300 to 2000 local and toll-free minutes and 100 to 500 monthly conference call minutes. You get unlimited extensions with these plans, so you can add as many virtual employees as you need. They offer a 30 day Free Trial with their AnyWhere Plans, so you can test them out before committing. Want a discount? Virtual PBX is currently offering up to 10 percent off if you sign up for their services via Revuezzle – or if you are a U.S. Veteran or Active Duty Military you can save 20% – so you could pay even less each month for excellent call quality and unlimited calling. Grasshopper is the professional solution to your telecommuting worker needs. They offer plans with hearty amounts of minutes that are shared amongst all of your staff. With unlimited virtual extensions you can add as many employees as you need without additional charges. If you go over your monthly allotted minutes you are charged 6¢ per minute. They offer no contracts so you can cancel at any time, they also feature toll-free numbers, voice studio, hold music and conference calling and customized messages for a more unique phone experience. They also have 24/7 customer support via a toll-free phone number. 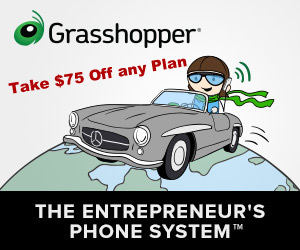 Grasshopper’s best deal is their Pay as You Grow Plan which starts at $12 per month – however the catch is that you don't get any shared minutes, but instead pay the standard for six cents per minute for all calls. The first plan to offer shared minutes is their Ramp plan for $24 per month and gives you 500 shared minutes. Their Grow plan is $49 per month for 2000 minutes and two numbers. With all their plans you get one free local or toll-free number. You can get $75 off any plan if you sign up now. If you sign up with Grasshopper you can enjoy up to $75 off any plan, but this is a Revuezzle exclusive so you will have to act now. Save $75 with Grasshopper Now! RingByName offers innovative virtual phone systms for companies that have telecommuting workers. While they focus on small to medium-sized businesses, those that have employees working out of the office can benefit from the services of RingByName. One thing RingByName offers that other virtual phone system providers do not is their innovative caller ID. This service not only tells you who is calling, but shows their photos and you can even add details about that client so that you can answer with a personalized touch. Also, you can program the RingByCentral dashboard to automatically forward calls based on which client is calling – so that they always deal with the same representative. RingByName is one of the more expensive virtual phone systems out there, but companies can enjoy unlimited calling and a free IP desk phone per user. Also, there is a three-year contract required with RingByName. For 2 to 4 employees, companies will pay $38 per user, per month. For the higher level plans with 50 or more users, the fee is $35 per user, per month. Want to improve customer relations regardless of where your employees work from? RingByName is specifically designed to improve customer service. Their innovative caller ID lets your team know just who they are talking to and even helps ensure customers speak to the same representative every time.